Last year (2016-2017), we spent a year in the USA. After four years living and working abroad, we found life in Utah amazingly convenient. After all, everyone spoke English. We were within driving distance of anything we could want, including IKEA. And Utah is a beautiful state, too. Even so, we found that we missed traveling overseas. Now understand, we did travel a lot within the US (we moved cross country, made road trips to Las Vegas and San Francisco, and explored a fair bit of the Beehive State). But here’s the deal: living and traveling in a different country simply stimulates the adventure gland in a way that exploring at home doesn’t. And also, not to be overlooked, I was practically at the bottom of the pay scale in Utah. Financially speaking, the writing was on the wall. Thus, I went on the hunt again, and when the chance to work overseas came, we took it. We knew we were kissing the ease of life in the USA goodbye, but we also knew it would scratch our travel itch and fill the necessary coffers more effectively (see our list of travel hacks–teaching abroad is number one). Here’s what goes into getting a job in China, getting the paperwork done, and getting a Chinese work visa after all that. Getting a job in China is like getting a job anywhere else: apply, interview, etc. China has an abundance of job openings in its many cities. We did some research and after consulting with friends who were already working there, we decided that Shenzhen seemed one of the best places in China to live and work, mainly due to reasonable air quality. There are a number of teacher recruitment agencies out there who specialize in matching teachers with appropriate positions. Happily, I was offered a job at Shenzhen (Nanshan) Concord College of Sino-Canada. My interview process bypassed a recruiter this time; I learned of an opening in the English department through a contact there and e-mailed the relevant individual about it. He replied, and after an exchange of emails, we arranged a Skype interview. I was offered the position and given a week to make a decision. After I accepted the position in Shenzhen, the paperwork stage began. Getting the Chinese work visa itself isn’t hard, but there are plenty of hoops to jump through. To be able to apply for a Chinese work visa, one needs to get a letter of invitation to work in China first. Here’s how it went for me. Then I needed to obtain and send notarized Chinese translations of the marriage and birth certificates. Finally, I had to physically mail both the authenticated originals and Chinese translations of our marriage certificate and children’s birth certificates, a signed statement that I would abide by Chinese laws and be a decent person, along with a signed contract. Several of the documents I mention here needed to be authenticated, too. What is authentication? Read on. Authentication is basically how a foreign government confirms the legitimacy of important documents. Authentication requires a series of steps, and it can be daunting if you don’t have any experience with the process. The process begins with a notary on the local end, then proceeds to the state level, and then on the national level, things go to the Secretary of State. At each level, your documents get stamped or sealed. Here’s how to go about getting your documents authenticated for China. The process is similar for the UAE, too, by the way. First, we take original documents (in the case of the degree, my notary made a photocopy and then indicated that it was an unaltered copy of the original) and have them notarized by local officials. The next step in the process is to take the notarized copy (in the case of the degree) to the county Clerk of Court and have that person indicate that the notary is, in fact, legitimate, and sign and seal this statement. Now that document goes to the State Capitol, where the Secretary of State applies the State Seal. Here’s a link to the State of Georgia’s website for any further clarification you might need, including FAQ’s. After that, the document is then ready to go to Washington, D.C., where it is stamped by the US Secretary of State. After all that, it has to go to the Embassy of whatever country (China in this case) where the document gets its final stamp. The local step is usually free; the state level costs a little bit (usually $10), and the national level costs more. The Embassy charges, too. Since we don’t live anywhere near Washington, D.C., we use a courier service (ProEx, who seem to offer the best rates) to tote our documents from one place to another, which greatly reduces the amount of time it takes for everything to be completed. As you might imagine, all those fees add up. if you’ve already worked abroad and had things authenticated before, expect to have the same documents re-authenticated, but with the addition of your new criminal background check. Though this defies all logic, it ends up being necessary. if your kids were born abroad, they should have Consular Birth Abroad certificates, which are national level documents, and these don’t need to be authenticated at the state level. if you, say, live in Seattle but your degree is from Texas, it may be worth contacting the Embassy to see where the authentication should be done. They can be rather particular on occasion. ProEx service fee and FedEx shipping: $205. US Post Office postage to ProEx: $40. As we’re speaking of expenses, it’s appropriate to mention those notarized translations. As I mentioned earlier, SCCSC needed notarized Chinese translations of our marriage certificates and children’s birth certificates. We found a great deal at $120 for those through a company in Utah. Happily, the translations and their notarizations could all be handled through email, so we didn’t have further shipping costs there. The next step in the China work visa process was simple: we scanned of all these authenticated and notarized documents for our own records, then sent them along with previously e-mailed documents to HR in China. Be sure to get delivery confirmation for anything you send to China: having delivery confirmation from DHL was very useful when my HR person claimed not to have received the shipment. As we could then demonstrate, she’d in fact signed for it days ago. It took Shenzhen government about 2 weeks to issue an official invitation letter (actually three documents). The invitation letter paved the way for the (nearly) final step: applying for a Chinese work visa. One must use a courier service to hand deliver documents to the Chinese Embassy’s visa office, or else take the documents in person. They do not accept anything by mail. We opted to do the latter, since we had Hotels.com rewards to take advantage of, and so we turned the hassle into a road trip which didn’t cost much more than having a courier do the work for us, and it allowed us to see some sights, too. 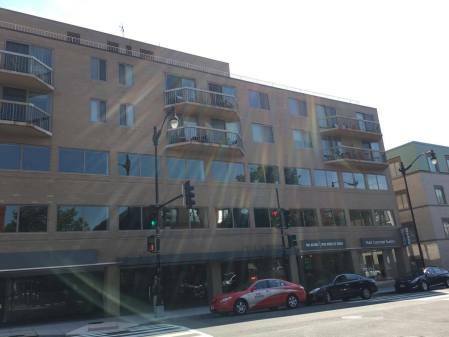 The Chinese Embassy’s visa department is, by the way, not in the Embassy building, but on Wisconsin Avenue. We parked under the nondescript office building, a privilege which cost $10. Recommendation: get there before the doors open, not at 11 in the morning. We would have to wait a long time; there were 60 people ahead of us. The nondescript office building where the China Visa Office is located. Parking is around the left of the building and underneath. 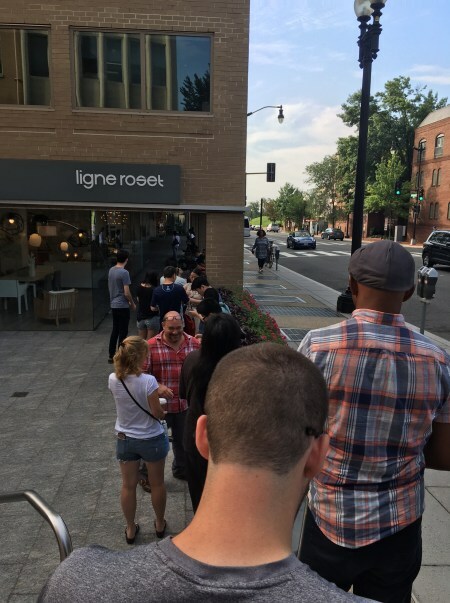 The line at 8:30 in the morning was long enough. Don’t get there later. 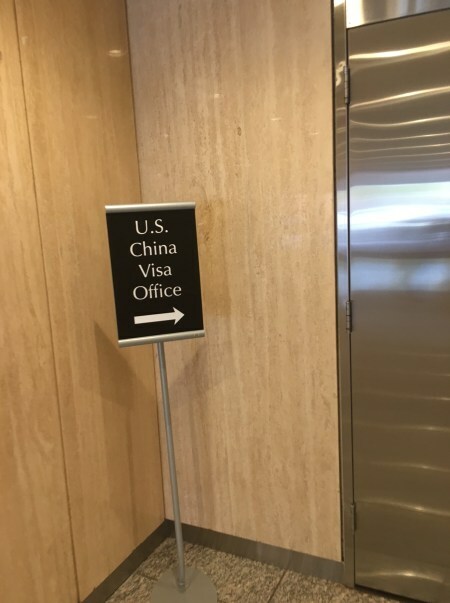 The China Visa Office’s sign helpfully pointing the way. The Chinese are extremely particular about the visa photograph size. There is a Chinese visa specialist who does pics on the third floor, so we left the throng and went up there, knowing we had time to kill. The pictures didn’t take long; for the four of us the cost was around $40. Our applications were complete with those, so back down to the waiting room. Be sure to type your visa application and print it afterward. The application won’t even be looked at if you fill it in by hand. There are people who show up with hand-filled paperwork and have to go upstairs to the Chinese visa specialist to get theirs typed up. Don’t let that be you. We bided our time for about 3 hours. Luckily the kids were well behaved. When we got to the window, the guy there glanced at our paperwork, answered our questions, gave us receipts, and told us when the visas would be ready. That was it. When we picked up our completed visas, we arrived at 8:30am, parked in the garage downstairs ($10), and then joined the queue waiting outside. When the doors opened at 9:30, we entered in an orderly fashion and the security guards gave us numbers in the order we’d been waiting in line. It took just over half an hour. The nice lady at the counter took our payment, then sent us one window over to pick up our passports. Next, we inspected our visas to ensure passport numbers and names were correct. I received the correct Z visa and my spouse and children had S1 visas. It is always wise to be sure you’ve been given the correct paperwork/had your name spelled correctly. If you plan to pay with a credit card, be aware that the visa department only takes MasterCard or Visa. We felt bad for a very nice elderly woman who had American Express because she got turned away. She took it in stride, but she’d have to come back and endure more waiting time. Yuck. Speaking of paying, the cost for our four Chinese visas was $560. Note: some employers will reimburse your visa expenses–which are hefty, as you can see, so be sure you save all of your receipts. The actual final step in getting a Chinese work visa comes after arrival. 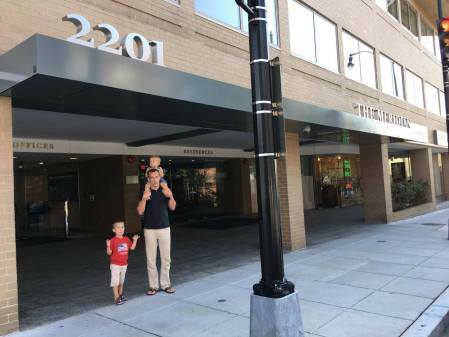 My Z visa issued in Washington, D.C. was good for a single entry and a month after that; after arrival HR took me to the local police station to finish the visa process. We submitted our passports with yet more paperwork the school had filled out, and in a couple of weeks we had our multi-entry visas affixed to our passports. These are good for a year. The school will basically renew them for us every year we stick around before we leave for summer vacations. As you can see, getting a Chinese work visa isn’t really hard, but it has numerous specific requirements and steps. Some of them are quick, others take a while. In any case, when you factor all of it together, it ends up taking months. If you are taking a job overseas that requires this stuff, get it done sooner rather than later. Again, be sure to keep track of all expenses and receipts, since the total could easily be over $1,000 is you have a family, and you could very well be reimbursed for your expenditures. Are You Ready to Live in China? Check our series about Life in China and learn what it’s like.